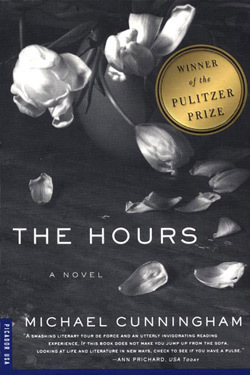 Retro Review: Michael Cunningham's "The Hours"
Home » books » new york » retro review » Retro Review: Michael Cunningham's "The Hours"
Three separate stories are told through the eyes of three very different women; Virginia Woolf as she writes Mrs Dalloway, Mrs Brown in 1950s American suburbia, and Clarissa in modern day New York. While these are very different women, they are united by the same conundrums; desire, love, and the fleeting nature of existence. Cunningham's prose is simple, elegant, and peppered with deeply profound musings on love, death, and time. His characters are full, complete. Whether it's Clarissa's devotion to Richard and his party, or Mrs Brown's struggles with her marital duties, I felt unbelievably close to these women. Having loved the film as I do, I wonder why I didn't read the book sooner. Cunningham explores his characters' deep-rooted fears with great skill, but in particular, the way in which the author illuminates Woolf's ongoing psychological struggle, is tender and beautiful. I could almost see this great woman on her frantic walks, equally afraid of living in suburbia forever, or losing her mind in London. The parallels between this story and Woolf's Mrs Dalloway are weaved gracefully, and unforced. The book made me long to return to this much-loved novel, and indeed, all of Woolf's novels (she's one of few authors to have their own section on my book shelf). While the novel is deeply moving, Cunningham also celebrates happiness for what it is; singular moments that will exist always.